Looking for a winning horse racing sytem? Here's a system that while very simple, is spot on. It invovles establishing the proper bankroll, checking out the races' favorite, narrowing down contenders, imagining the outcome of the race, and making adjustments. For me, it's been a winning horse racing system. If you'd like to see my horse racing tips and picks, sign up for my free newsletter. Establish your bankroll. This should be "investment" capital and not money that is needed to sustain your daily lifestyle. Don't under-capitalize yourself but, on the other hand, don't go crazy either. Your bankroll should be an amount your comfortable with. 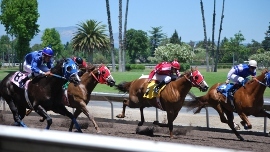 Determine the percentage of your bankroll you are willing to invest on any particular race. Two percent is a reasonable amount. This is the cornerstone to any successful horse racing system. Assess the favorite. In your initial overview of a race, attempt to determine whether the favorite is "solid", "vulnerable" or "false". Don't waste time on races where the favorite looks tough and concentrate on those events where the chalk can be erased. Try to limit yourself to six-to-eight truly-playable races on a typical day if investigating both the northern and southern circuits. Three-to-five is a good number if concentrating on one track but this number can go up or down based on the opportunities available. Pick your contenters. Employing whatever handicapping methods you prefer, establish the order of preference for your contenders. Make a "value" line to help in your ultimate on-track decisions. Use your imagination. Attempt to visualize how a race will be run and don't be afraid to go against the flow. If you can't get a clear picture of what's going to happen beforehand, you probably don't have a good idea on which horses to bet on. Plan your day. Eliminate the un-playable races and sketch out a battle plan on paper with potential win bets, singles, exotic wagers, etc. In other words, have an idea of what you are going to do before you go to the track. Let your horse racing system guide you. Don't waffle. Once you're in the thick of the action, stick to your guns. Let the toteboard determine your final moves and not the guy at the bar who heard from his trainer that such-and-such a trainer really likes his horse in the 5th. It's your money and you should make it or lose it on the basis of your own opinions. Apply disciplines money management. Don't press when you lose or increase your wagers when you win. Protect your bankroll and don't be overly aggressive. Remember that there will be plenty more opportunities the next day and the day after and the day after that. Winning or losing on one individual day really doesn't mean a thing. Only the long term matters. Adjust when it makes sense. Be willing to change your thinking if evidence warrants. Perhaps a strong bias has appeared. Maybe your top selection is grossly overbet. Be prepared to move on to your second or third choices if that's where the 'value' happens to be. If your top choice is simply 'overbet' in the win pool and you have no strong secondary options, look for ways to exploit the short-priced horse in the exotics. Have fun. Keep your composure and keep your sense of humor. Both are weapons that can help you overcome adversity and succeed at a game that is difficult, but not impossible, to beat. This is the most important component of any horse racing system!